Dacia has been Europe’s fastest-growing car brand since 2004, and since its UK launch in January 2013 its “shockingly affordable” prices have struck a chord with the British public. Part of the Renault Group, Dacia’s principles of simple, honest pricing and function-over-frivolity mean the cars are simple to use and affordable to own. 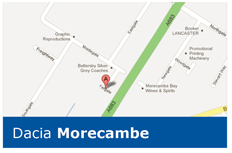 At DSG we offer the full range of new and used Dacia cars in the North West, servicing Lancashire and beyond from our dealership in Morecambe. 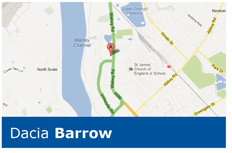 Our Morecambe branch is the Bay’s main Dacia Sales and Service Centre, with our Service Centre in Barrow also providing full Dacia aftersales facilities. Find out more about the Dacia Sandero, Stepway, Logan MCV and Duster models here on our website, or call us today to speak to one of our Dacia experts.